Established in 2007, Work Management Solutions is a globally recognised team of asset management specialists with a strong track record in driving enhanced performance for asset intensive businesses. With extensive experience and expertise across numerous organisations and industries, we utilise our innovative integrated approach to reduce risk, increase productivity, and optimise efficiency for the organisations we partner with. Our proven end-to-end methodology is designed to maximise your organisation’s ROI, and by seeing solutions through from development to implementation, whilst also working closely with your people to advance internal capabilities, the improvements we deliver are both economical and sustainable. Specialising in asset management consulting and contract technical resources, our functional knowledge and expertise spans a range of disciplines and industries. Our company was founded with a genuine care factor and passion, and to this day, we’re committed to consistently upholding our values in everything that we do. Our high performance team has the passion, drive, and commitment to be the supplier of choice. Our purpose is our people and we aim to provide consistent contracts on an ongoing basis with a focus of the highest professionalism for interactions between both clients and candidates. We strive to be involved in community activities and improvement initiatives. 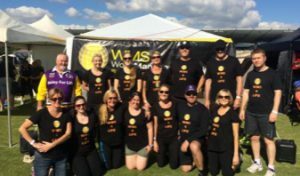 Every year we are involved in the Relay for Life for the Cancer Council and we aspire to be involved in many more community activities to promote community connection. We respect and accept all people and promote equity and diversity in our business practices to support community structures. Safety is our priority, and we are focused on maintaining safe and healthy workplaces for our candidates. Our team promotes health and wellbeing in all facets of our business and provides regular online updates on safety awareness. Our accountability is to our people with the commitment of providing our employees with the tools and knowledge to succeed in their roles. We provide our staff with the knowledge and experience to drive business and provide opportunities for employees and clients alike. It is our understanding of work life balance that acknowledges the needs of our candidates and their long-term career goals. We strive to achieve honest and open communication with our clients and employees to honour our commitment to work in solidarity. We aim to achieve the best outcomes and we believe that maintaining honest relationships builds trust.